April 12, 2015 – People living in Metro Vancouver are expressing some desire for change in the way they are governed at the regional level, and on the ideal number of municipalities in the region. However, there is little consensus on what those changes should look like. That said, there is much more consensus among respondents over issues regarding which services should be led and managed at the regional level, and which ones should be delivered by existing local governments. Those are among the findings of an Angus Reid Institute public opinion poll that canvassing broad opinions among Metro Vancouver region residents about how their sense of regional and local identity, views on governance, shared services, and the ideal number of municipalities for Metro Vancouver. The poll findings may serve as a possible starting point for discussion in regards to regional governance and related issues in Metro Vancouver, issues that would seem to merit further study in the future. What kind of region do we want? This Angus Reid Institute poll of Metro Vancouver residents asked two key questions on the overall fundamentals of the region’s urban governance model. The responses highlight little consensus, and some – but not massive – appetite for change. A significant minority (41%) chose to “keep the status quo, which means electing local mayors and councillors at the local level, who then represent their municipality at the regional level”. The results show a rather profoundly mixed view – essentially a three-way split – across the major segments of the Metro Vancouver population. Although this study is not focused specifically on amalgamation, it does make sense to canvass the issue, given that combining smaller local municipalities has been visited, and revisited in several major urban centres in Canada. Notably, there are differing views over whether such unions were for “better or for worse”, as separate studies and analysis show. Among notable past examples of amalgamation, the City of Halifax merged in 1996, while the City of Toronto amalgamated in 1998, with six distinct municipalities dissolving into one single urban entity. In Ottawa, amalgamation occurred in 2001. While city staff there claim the moved to fewer municipalities resulted in $101 million in savings over a three-year period, others have questioned whether city staffing levels have grown disproportionately since amalgamation occurred. Nor does amalgamation always “take”. Case in point – the Island of Montreal, where individual municipalities were amalgamated into one in 2002. The public outrage over this was significant enough to turn it into a provincial election issue, and by 2004, more than 20 referenda were held in which 15 municipalities voted to leave the amalgamated city. This happened in 2006. Currently, conversations are underway in and around Victoria, BC, over whether more than a dozen municipalities in a relatively small geographic area, making up roughly 360,000 people, should amalgamate. 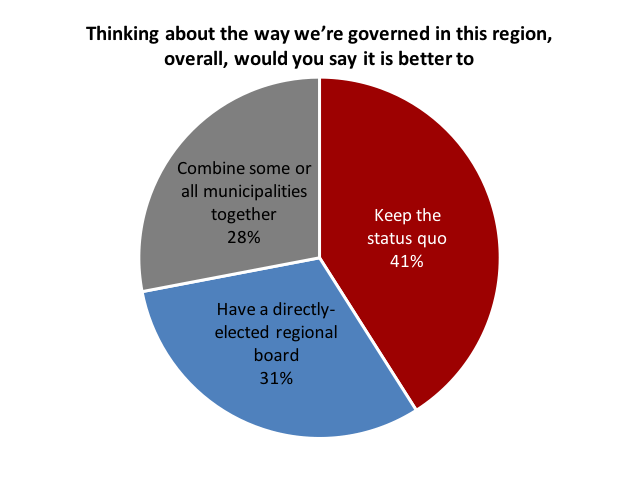 The Angus Reid Institute poll asked Metro Vancouver residents to think specifically about the possibility of combining municipalities in this region, and to indicate how many individual municipalities were ideal in the region. Respondents were invited to choose their ideal number – anywhere between the current 24 local governments and one single regional government. Looking at views among the main segments of the Metro Vancouver population, the biggest differences are noted regionally. Those living in the City of Vancouver tend to be stronger proponents of five or fewer municipalities (58% versus 40% in the suburbs) while suburbanites are more in favour of keeping the current number of municipalities (31% versus 17% in the City of Vancouver). City of Surrey residents fall between Vancouver and suburban respondents, 53 per cent opt for five or fewer municipalities and a quarter (24%) for keeping the current number of municipalities. In any of these cases however, there is no “easy consensus” on this key question. On one important issue, respondents are split: 51 per cent would like to see policing managed at the local/municipal level (this includes being serviced by local RCMP detachments) while 49 per cent would prefer a regional police service. Perspectives on services management vary markedly by people’s views on the ideal number of municipalities in the region. Those opting for five or fewer municipal governments in the area are much stronger supporters of regional control over these services compared to their counterparts who would opt for the current 24 municipality model. Those in the City of Vancouver tend to be the strongest proponents of having these services managed by a regional government: a majority would assign five of the eight that way (adding police and senior services to the regional list). Vancouverites are also close to split on fire protection and parks. Residents outside of Vancouver and in the suburbs, on the other hand, are much stronger supporters of local municipal management of services. And with respect to age, younger Metro Vancouver residents are stronger proponents of regional control than those middle-aged or older. People with more formal education are also more in favour of regional control over these various services. Residents in the region generally identify more with their local municipality over the Metro Vancouver area as a whole by a margin of two-to-one: 64 per cent versus 36 per cent respectively. City of Vancouver residents are more likely to identify with the region (55%) whereas most of those living outside Vancouver identify with their own municipality (averaging seven-in-ten). The survey results also show big differences across generations: those under 35 are almost evenly split as to how they identify (45% Metro Vancouver versus 55% local municipality) while fully three-quarters (74%) of those over 55 identify more closely with their local municipality. This key dimension of identification also relates to views on amalgamation and services. Those who identify with their local municipality are much more likely to opt for maintaining the status quo in terms of the overall governance model and for keeping the various services under local municipal management.